I fished a little bit this weekend, but not enough to muster a real post about the outing. I'm currently testing the Try 360 6:4 tenkara rod from Tenkara Times. First impressions are surprisingly good, but that will be a post of its own later. Today, I thought I'd toss this infographic provided by the folks at Austin Canoe & Kayak. I'll admit it, when I purchased my Native Slayer, I didn't go local, I went internet. I know, I'm going to Hell. The folks at Austin Kayak made it difficult not to, great prices, excellent shopping tools, complete fishing packages, free shipping to my door, no sales tax, and what I've found to really be a best of breed e-commerce experience. As someone who makes their living in e-commerce, I know that it's not easy to arrange delivery of an oversized item via truck line to a customer's door, but these guys know how to service that customer's needs and do it very, very well. Anyway, and I'm not sure if was coincidence or not, a little bit after my purchase they contacted me about doing a guest post. 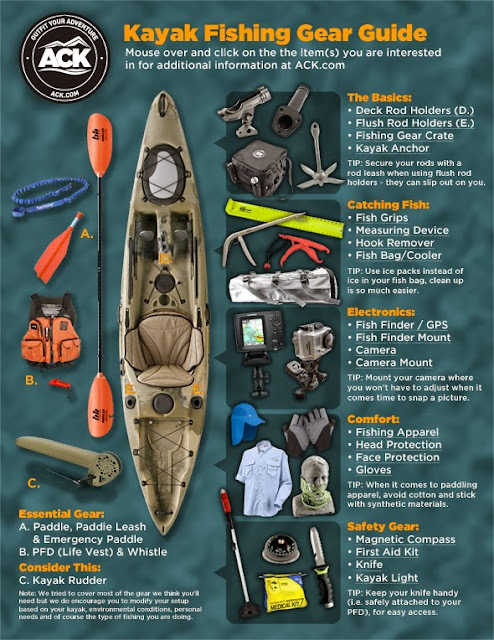 Turns out it wasn't so much a text post, they did send this "Gear Guide" graphic of all of the great stuff you can outfit your kayak with for fishing purposes. Joseph is an avid kayaker based out of the central Texas area. sea kayaking events or just having some fun with a kayak or paddleboard. and loves that he gets to spend time working with his favorite toys. If you're in the market for a kayak (or any of the additional gear), Austin Kayak provides a lot of great shopping tools, like the interactive version of the Gear Guide displayed above, tons of how-to videos that explain products as simple as a stakeout pole, and probably most importantly, a Kayak Selector which will help you narrow down the various kayak choices to a ride that best fits your needs. Nobody at Austin Kayak compensated me in any way to post this Gear Guide or say glowing things about their customer service. My shopping experience was really that good...from the fact that I pestered them with private messages on Facebook the weekend before my purchase...to the fact that I ordered the stuff on Sunday and it shipped out on Monday...to the very CLEAR communications via email regarding the status of shipment and what to expect during delivery...and even the fact that the delivery service didn't hassle my wife who was at home that day to "receive" the boat. Ha. That's pretty funny, although I would suspect that would mean "instead of electronic or battery operated compass" which might not fare well if wet.